You can order a personalized copy of the book direct from Lori by using the Buy Now button to the left. The order will be processed through PayPal. "I just read this great book. It has a powerful message that all kids could use! And adults!! It all starts by loving ourselves & then others!!! Check it out...the price is great too!" 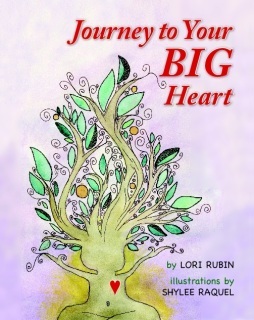 "A beautiful journey through the heart of a child. This book should serve as a primer for all young people aspiring to realize their full potential. Ms. Rubin has produced a tour de force that is destined to be a children's classic for years to come. The illustrations are whimsical yet poignant and the perfect accompaniment to the story line. A must read for you and your child." "a simple message that applies not only to children but also to every adult. the graphics are beautiful and perfectly complement the beautiful message of love. should be required reading in every home whether you have children or not. after all, were all children at heart. Read this and you will smile & who doesn't want that??"